Back in my university days, we played some recreational inner-tube #waterpolo (you sit on an inflatable inner tube and toss a ball around between two teams). My ragtag team of misfits was called the Water Duckies, but I still think the computer science team had the best name: The Floating Points. Idly thinking - for Diffie-Hellman-Merkle-Williamson we want to know for sure that we&apos;re using a prime. But certificates of primality usually require factoring p-1, and if p-1 is easily factored, there&apos;s a risk that the system is insecure, because the base might have a small period. In d&d tonight, our dwarf barbarian drew a card from the deck of many things, and now she has three wishes. The question is not "what's your use case for having this be a flat file in Git." It's "how do you guarantee that we won't ever wish this was just a flat file in Git". "Huh. I remember admiring your portrait for being so lifelike, but..."
"You like it? It's a concept thing I came up with. I'm having the artist come in regularly and alter it, to make me uglier." "Oh, like, a comment on the corruption of man? Amazing! You're so clever, Dorian!" "Here is your reward," the genie said. "A tattoo machine? I already have four." "It is magic. As long as you do not tell anyone, what this writes will come true for the person tattooed." "Ah. Well. People used to get 'Love' or 'Death' or 'Mom', but these days-"
"If you kiss me," the dragon said, "I will turn back into a prince." "And if I don't?" the princess asked. The demon appeared in the summoning circle. "Cool!" one of the astronauts said. "We have summoned you," the other said, "to carry a message to Earth." The demon glared at them. "Where. Am. I." "In orbit. Tell Ground Control we are okay, but the solar storm killed our radios." Harry Potter made a lot more sense to me when I started working in software engineering. @ischade heard a story of someone who did a spelljammer campaign where they stopped off in Dark Sun world, where arcane magic, Defiler magic, consumes life around it. party wizard gets obsessed with finding a way to strip Defiler magic of its horrors. after years of ingame time and visiting dozens of lands he finally finishes his project, and casts... the same magic missile he first cast as a shardling. "congratulations, you have gained a free level. you are now a Wizard 15/Wizard 1." 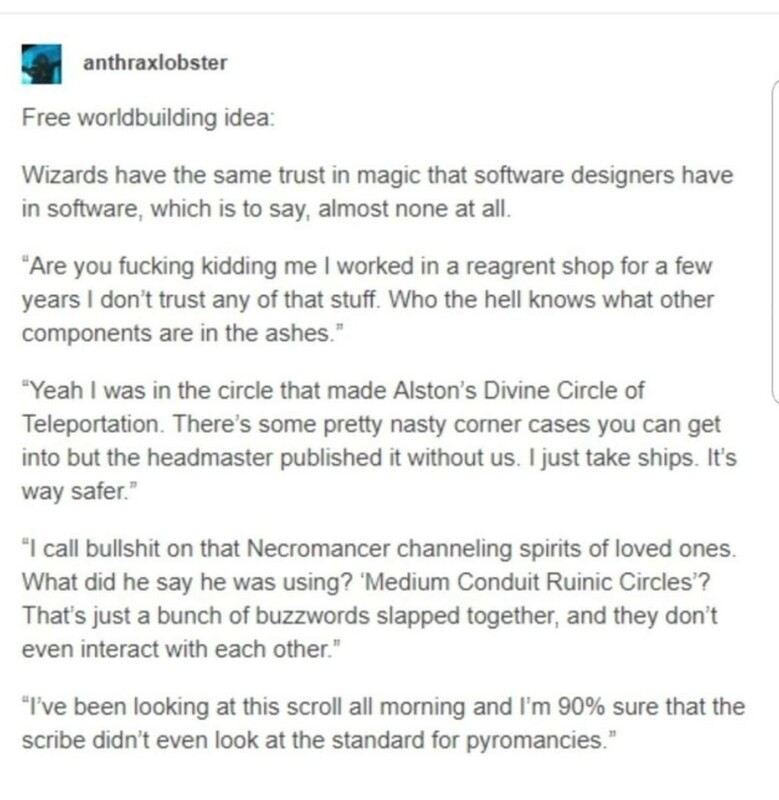 "Free world building idea: Wizards have the same trust in magic that software designers have in software, which is to say, almost none at all." Apparently today is St Jordi day. Every year I forget and every year my mom reminds me. Happy Jordi day to me and all other Jordis and Jordinas out there! So now I think I&apos;ll try to find "capitalist" primes: that I define as follow. A capitalist prime is a prime number p > 5 such that at least 50% of the values 2!, 3!, ..., (p-1)! belong to at most 1% of the classes modulo p.
Me at work: "That&apos;s more regex than I ever want to see again"